By Dennis Zaki - After repeatedly denying any wrongdoing, Alaska Senator Lisa Murkowski broke down today and said she is selling a prime piece of land she illegally purchased below market value back to a long-time political supporter. She had claimed she was going to live on the parcel. The supporter, real-estate developer Bob Penney, is also caught up in Alaska Republican Senator Ted Stevens' criminal investigation. TPMMuckracker.com broke the story about Murkowski's illegal deal last week. This comes a day after a 15-page Senate ethics complaint was filed against her by the National Law and Policy Center. Murkowski refused to disclose the purchase price of the 1.27-acre vacant tract all last week but finally relented after pressure from media organizations. Real estate developers say the land could sell today for nearly $120,000 more than the $179,400 she paid for it. Senate ethics rules prohibit senators from receiving gifts from personal friends if the value is over $250. Murkowski bought the riverfront property from Bob Penney, a real estate developer, who has claimed ignorance to the value of the land he sold to Murkowski last year. "Word of honor, I did not know what the assessed value was," Penney is quoted by the Anchorage Daily News. "I thought it was still $120,000." Ken Boehm with the National Legal and Policy Center, a government watchdog group, told KTUU.com that the deal stinks of corruption. Regardless of a willing buyer and seller, he said if a public official pays less than market value, there are legal and ethical red flags. "If you say as long as you buy it at the assessed value and in a given area properties are running 10, 20, 30, 40 percent in terms of the market value over the assessed value. Then anybody who wants to corruptly influence a public official says, "Hey why don't you buy some land at the assessed value?' And if public officials can do that and that becomes a wink and a nod, then you have a loophole you can drive trucks through," Boehm said to KTUU.com. Bob Penney is well known for his land deals in Alaska, he is also caught up in the Ted Stevens criminal investigation. 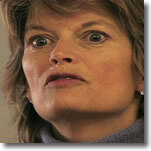 Lisa Murkowski was appointed senator in a well known nepotism case when Alaska's former senator, her father, Frank Murkowski, was elected Governor of Alaska. He appointed her to fill the remaining two years of his seat.